WASHINGTON— A coalition of wildlife groups petitioned the U.S. government today to designate seven species of pangolins as “endangered” under the country’s Endangered Species Act and also asked for the protection of pangolins under the Act’s “similarity of appearance” provision. Small and scaly, pangolins are the world’s most illegally trafficked mammal and in danger of extinction. It is estimated that more than 960,000 pangolins were illegally traded over the past decade. While these armored creatures once inhabited vast portions of Asia and Africa, their populations are severely dwindling due to a massive and growing demand for their meat and scales, which are erroneously believed to have curative properties in East Asian medicine. Most illegally sourced pangolins are destined for markets in China and Vietnam, but demand for pangolins in the United States remains significant. At least 26,000 imports of pangolin products were seized in the United States between 2004 and 2013. If protection is granted under the Endangered Species Act, the import and interstate sale of all pangolins and pangolin parts would be prohibited in the United States, unless such activity can be shown to promote the conservation of the species. A listing would also heighten global awareness about the importance of conserving the species. Currently only one of the planet’s eight pangolin species — the Temminck’s ground pangolin of Africa — is protected as endangered under the Act. Because all species of pangolins so closely resemble each other that law-enforcement officials have difficulty distinguishing them, the groups also filed a “similarity of appearance” petition. If it is granted, trade and import of all pangolin species in the United States would be banned to ensure the currently listed Temminck’s pangolin is not imported due to false identification. “These little-known species are critical to their ecosystem, but they could go extinct before most people even hear of them. We encourage the U.S. government to list all pangolin species under the Endangered Species Act expeditiously, taking an appropriate global position of leadership in doing everything possible to save these animals from extinction,” said Adam M. Roberts, CEO of Born Free USA and the Born Free Foundation. Countries around the world are looking for solutions to address this dire crisis facing pangolins. 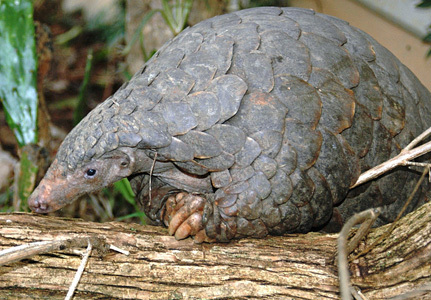 Representatives from 29 pangolin-range countries in African and Asia recently converged in Da Nang, Vietnam to participate in the First Pangolin Range States Meeting hosted by the governments of Vietnam and the United States. The meeting sought to foster collaborative efforts among pangolin-range states, pangolin-consuming countries and relevant stakeholders. Discussions focused on the latest pangolin population and trade information and examined the increasing illegal international trade. The parties also agreed to a set of recommendations to protect pangolin species against overexploitation as a result of international trade. The groups filing the petition are Born Free USA, the Center for Biological Diversity, Humane Society International (HSI), The Humane Society of the United States (HSUS) and the International Fund for Animal Welfare (IFAW). Born Free USA is a global leader in animal welfare and wildlife conservation. Through litigation, legislation, and public education, Born Free USA leads vital campaigns against animals in entertainment, exotic “pets,” trapping and fur, and the destructive international wildlife trade. Born Free USA brings to North America the message of “compassionate conservation” — the vision of the United Kingdom-based Born Free Foundation, established in 1984 by Bill Travers and Virginia McKenna, stars of the iconic film “Born Free,” along with their son Will Travers. Born Free’s mission is to end suffering of wild animals in captivity, conserve threatened and endangered species, and encourage compassionate conservation globally. More at www.bornfreeusa.org; www.twitter.com/bornfreeusa; and www.facebook.com/bornfreeusa.